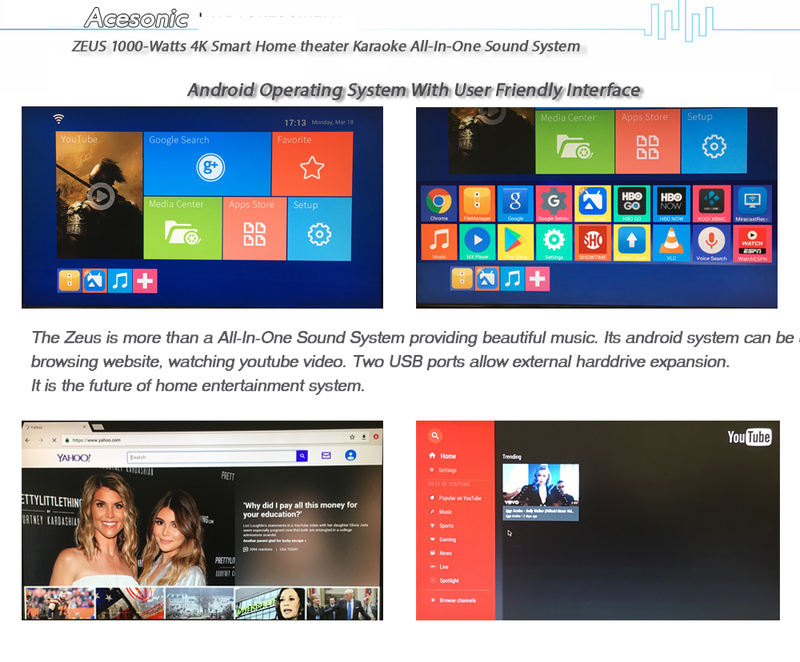 The Acesonic Zeus SoundBar is a 4K Android Multimedia Karaoke SoundBar. It is the most advanced & Powerful SoundBar device in our SoundBar lineup! This SoundBar is packed with so many powerful features, making it the center of home entertainment! From our initial design, we intended to build a device that can satisfy all of your entertainment needs for now and the future to come! The Built-in Android operating system, users can use it browsing website or watching youtube. It can be connected to TV, game console (ex. PS4, XBox one) , any Video device (ex. DVD Player ) or bluetooth enable device.(ex. Cellphone, tablet). Its powerful 1000 watts peak output allows user to enjoy crystal clear music with deep bass. Two Built-in USB 2.0 connectors enable you to connect a wide variety of peripheral including USB drive, keyboard or mouse. HMDI input allows users to connect it to TV, game console, PC or playback device.